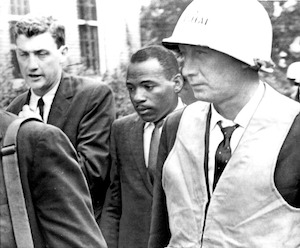 James Meredith, the man who integrated the University of Mississippi in 1962 with the help of federal marshals, will be inducted into the school’s Alumni Hall of Fame along with six others during this year’s homecoming events in October. Federal marshals escorting James Meredith to class. Meredith sued to gain admission as the first Black student at Ole Miss and, due to fierce opposition from state officials and violence from the public, was escorted to and from his classes by federal law-enforcement officers. After graduating, Meredith was shot down on June 6, 1966 while making a lone “March Against Fear” to encourage Blacks to exercise their voting rights. He wanted to show that a Black man could safely walk through Mississippi. On the second day, a sniper proved just the opposite, as photos of the wounded Meredith lying on the road hit the national news media. He was planning to walk 200 miles from Memphis, Tenn. to the Mississippi state capital of Jackson. Civil rights leaders, including Dr. Martin Luther King Jr., completed the effort on his behalf. Meredith, now 85, lives in Jackson with his wife, Judy Alsobrooks Meredith. He told Diverse in a recent interview that when university officials informed him that he was being considered for induction into the Hall of Fame, he was stunned. “I thought they must have been out of their minds – that’s how it sounded to me,” he said, explaining that after he graduated Ole Miss, he was not a cheerleader for the institution. “I declared war on White supremacy, and Ole Miss was the highest order of White supremacy. . . So when they said they were giving me an award, I saw it as surrender — the same as when the Japanese surrendered,” he said, laughing heartily. But to many in the state and throughout the South, Meredith has been an enigmatic figure among the numerous activists involved in the civil rights movement. While he is revered for his role in the fight against segregation, he has been bitterly criticized for working in the 1980s as an adviser to Republican North Carolina Sen. Jesse Helms, an outspoken opponent of racial equality. Helms supported the White minority government of South Africa and attempted to block passage of the Martin Luther King Jr. federal holiday. 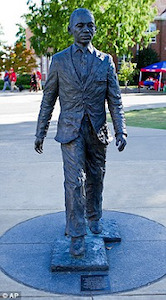 Statue of Meredith on Ole Miss campus. The list of honorees also includes longtime U.S. Sen. Thad Cochran, R-Miss., who retired in April due to illness. He was elected to the Senate in 1978, was re-elected six times, and served as chairman of the Senate Appropriations Committee. The university’s announcement of the inductees made no mention of Meredith’s turbulent admission into Ole Miss or the racial conflicts that surrounded it. Rather, it simply stated: “After graduating from high school in Florida, he served nine years in the Air Force before becoming the first black student at UM in 1962 and later organizing his lone ‘Meredith March Against Fear’ in 1966.” The purpose of the march and the fact that Meredith was shot were not included. The announcement did state that Meredith graduated from the university with a degree in political science, earned a master’s degree in economics from the University of Ibadan in Nigeria, received a law degree from Columbia University and authored 27 books. Meredith said he noticed the omissions but remained sanquine about the induction, stating that he plans to attend and to speak. He pointed out – again, laughing – that event organizers have informed him several times that he will have a three-minute limit. Meredith had little to say about his experiences as the only Black student in his classes. “There’s not one person that I could describe,” he said, explaining that he was not interested in making friends or being cordial at the time. In 2015, the statue was vandalized with a noose being placed on it by Sigma Phi Epsilon fraternity members, one of whom served a six-month jail term for the crime.